Your home should be a reflection of you. Your style, habits, and needs in terms of space. And since existing houses are designed to fit an architect or developer’s vision, not necessarily the occupant’s, all too often when buying an existing home, we make compromises. As a general contractor, we see the fallout of purchasing a house that only meets a fraction of the buyer’s goals. The prevalence of remodels and additions are proof of homeowners’ dissatisfaction with the existing layout of their homes. And though it’s a wonderful and exciting pursuit to upgrade a home and witness its transformation over time, building a custom home allows you to create something perfectly, starting from square one. 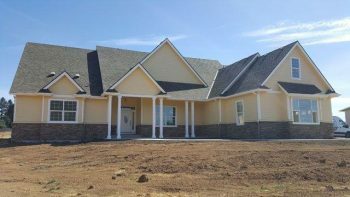 Star Builders LLC is a close-knit team of craftsmen and women who combine their experience and creative vision to develop homes that cater to your needs from the very beginning. When Salem residents work with us, they gain insight into great ideas for new home design and construction. Our goal is not only to create quality homes, but to make the process fun and stress-free for our clients. From the sensible placement of windows and doors to smart ways to maximize usable space, a home built by Star Builders is more than just a house – it’s a retreat. Pouring the Foundation – We’ll evaluate the condition of the vacant land and decide what needs to be done before we pour the concrete foundation. Sites need to be graded, excavated, and set according to precise measurements on a plot map. We consider variables such as weather and supply delivery times to ensure that no mistakes are made by pushing the limits. Exterior Framing – The next phase involves building the frame of the home. Once the frame is up, we address weatherization, sheathing, roofing, doors, and windows. Utilities – Before the sheetrock goes up, plumbing and electrical need to be professionally installed and inspected for safety. We take every measure necessary to check plumbing and electrical systems before progressing to the next stage. Insulation – Once the piping, water heater, ductwork, and wiring are installed securely, we move on to installing the insulation, sheetrock, or drywall. Finishing Details – The exterior and interior finishes are added during this final stage. Any interior doors, flooring, sills, tiling, countertops, cabinets, appliances, lighting, and fixtures are installed, inspected, and tested at this point. Our team also takes care of painting, installing walkways, and landscaping. Over the years, Star Builders has developed a reputation for quality. And our long list of awards and happy clients attest to that claim. When we start a home building project, we bring the right people to the table, leave no questions unanswered, and take the time to maintain clear communication throughout the project. 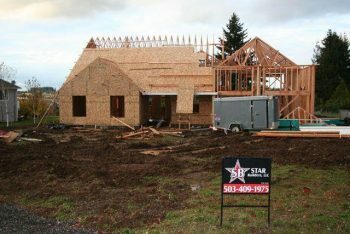 For Salem residents looking for a quality home building experience and a quality home, choose Star Builders. Your custom-built home is waiting. Call Star Builders Today.